Mensusa https://www.mensusa.com/articles/look-dashy-in-a-2-button-burgundy-suit.html Look Dashy Even In A Suit With A 2 Button Burgundy Suit Everyone wants to be the centre of the attraction. And the easiest way through which you can serve this purpose is the attire of yours. Wearing something exceptional always depicts your unique personality among thousands. And a 2 button burgundy suit can serve your purpose in the right way. There would be hard to find a single person in the world who does not like to wear a suit. It can be said without hesitation that a gentleman's closet is incomplete without a suit because a suit is for every purpose. It is the one thing that can complement your attire in any purpose. But while buying a suit, most of the people go for the traditional black or brown color because generally the other colors fail to look eye-soothing. And as a result of it usually a suit fails to depict your exclusivity. But you can turn your suit wearing as your unique fashion statement if you select a 2 button burgundy suit as this color is not only rare in suits but also has a touch of elegancy. Like various colors, there are various designs in suits also. Every particular design of suits gives you different appearance. And among these various types of suits, a 2 button suit is the thing which has been always applauded by every men of every country. 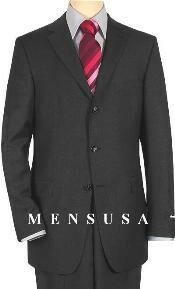 This suit can be distinguished than any other suits for its casual and stylish look unlike the other suits. And it is the main why that this suit is always in trend. So once you invest your money on a 2 button suit, you can be sure to make a long term investment. Once you buy a 2 button suit, it can be perfect for your party wear. Indeed, this particular type of suit always stays on the top of the list of party wear for men. The specialty of the suit is the trendy look of those which gives you a friendly appearance. And that's why wearing a 2 button suit you become successful in carrying a cool look even in a suit. That's why the 2 button suits are getting more popularity among men now-a-days and as www.mensusa.com knows the demand of today's generation in the right way, you will get a huge stock of 2 button suits here. You can make the purpose of a 2 button more versatile if you select a 2 button burgundy suit because there is nothing to say that this color can be hardly found in suits so at the very moment you wear it, it provides you a unique appearance among everyone. But the best thing about this color suit is that it can be wore at any time either it is day or night. All that you have to do is to select a perfect color shirt with your burgundy suit. Without going to any complication, you can select a light color shirt like off white or light yellow with your burgundy suit and if you want to give yourself a dashy look, wear it with a jeans and be ready to create your unique impression.